Chad Greenway is a former NFL linebacker who spent his entire 11-year career with the Minnesota Vikings. He played college football at Iowa, and was drafted by the Vikings in the first round of the 2006 NFL Draft. Greenway is married and has four daughters. In his talk, Faith & Football: Rising Above, Chad will connect his love of sport with his faith, which helped him keep on a straight path while being a pro athlete. 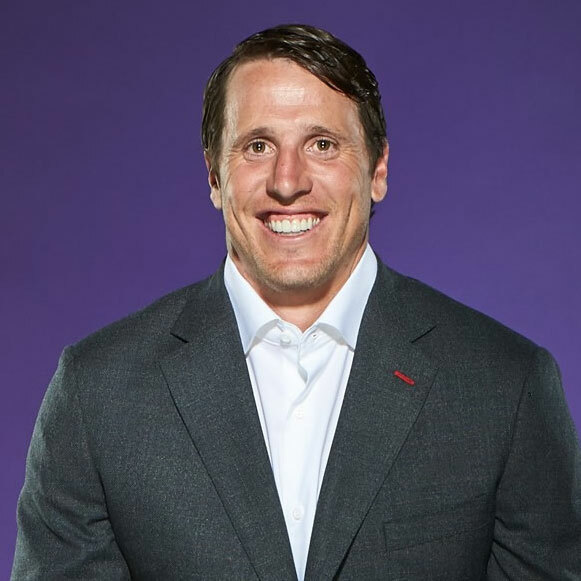 In 2008, Greenway established his charitable foundation, Chad Greenway’s Lead the Way Foundation. Its primary focus is providing seriously ill and physically challenged children throughout the Twin Cities with daily support and life-changing experiences. The foundation has three signature programs, touching the lives of nearly 375,000 people in the Twin Cities. The TendHER Heart Luncheon is hosted each year to honor mothers of chronically and critically ill children for the sacrifices they make in caring for their ill child. The luncheon provides these women with the opportunity to take time for themselves and enjoy each other’s company and support. The mothers are served gourmet dishes and receive a few special gifts to take home. The Field of Dreams program was established to give critically and chronically ill children and their families some magical memories by fulfilling sports wishes and vacation dreams. The foundation foots the bill for a day of fun activities, tickets and food at a fun getaway location like the Kalahari Waterpark or Mall of America. Chad’s Locker is an electronics hub that provides access to iPads, laptops, Leap Frog Readers, DVDs, games and other electronics to hospitalized children and their families. In addition to the entertainment devices, Chad provided toys, coloring supplies, dolls, action figures and board games.